I went to Dumpling Station, which I wrote about more extensively in my first post about LA trucks. It’s the only LA food truck I’ve been to more than once (four times now! 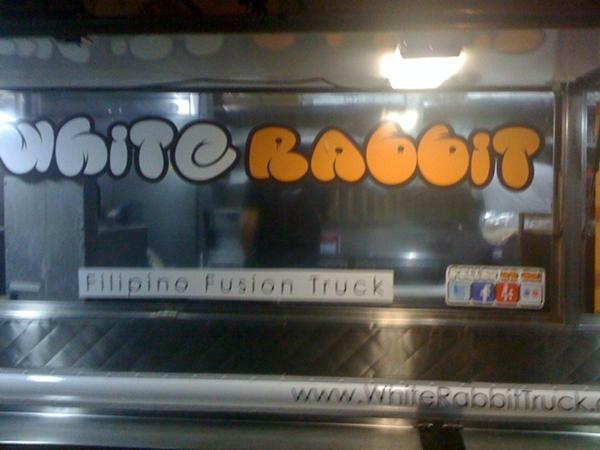 ), and is quite possibly my favorite LA food truck as well. They get bonus points for putting up with my sister’s dog barking and growling at them this time around. 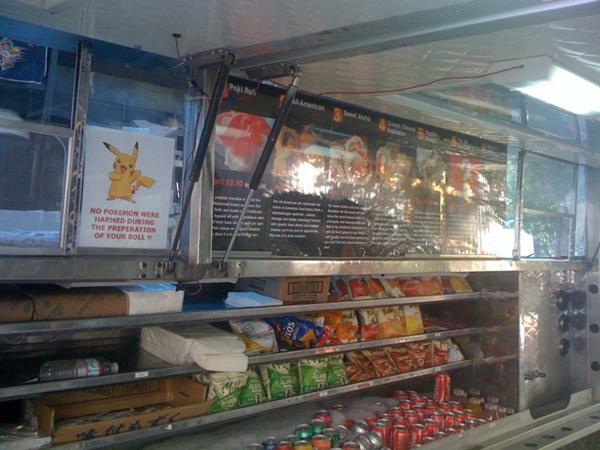 I didn’t know he would be so rude in a food truck setting, but they were totally cool about it! 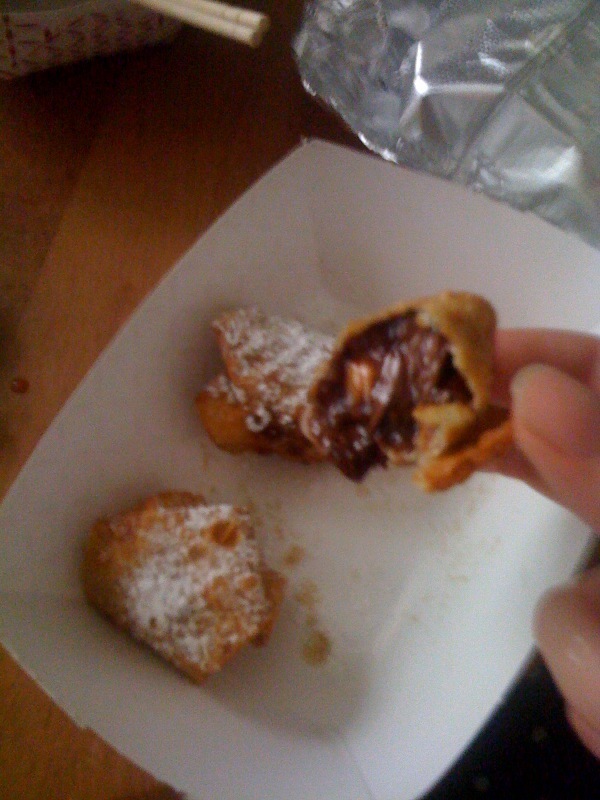 I got their vegetable dumplings (which I had had before) and their Nutella banana wontons (which I hadn’t). Sunday I drove back to the bay area, and Monday evening I returned to Edgewood Eats. It felt good to be home, and at a local food truck gathering again. My first stop was Eat on Monday, a truck that doesn’t usually have vegetarian options. 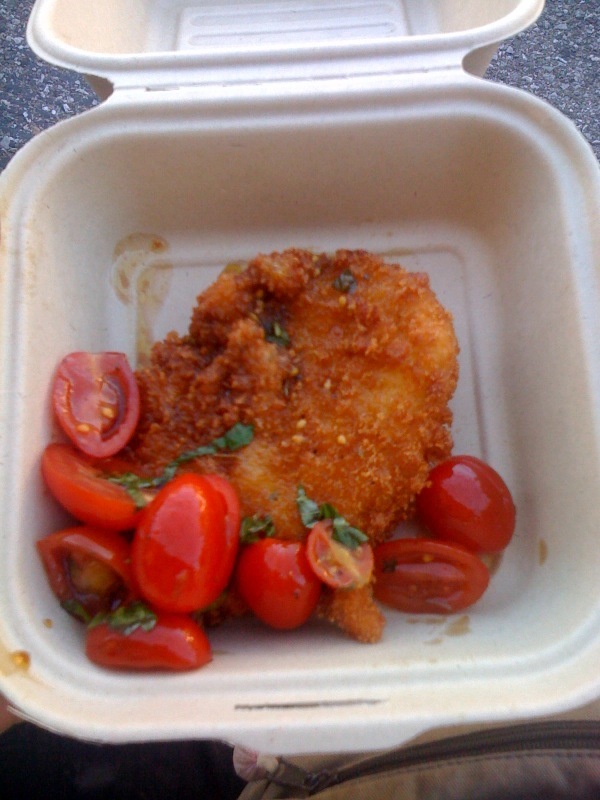 This time, though, they were serving fried mozzarella, and I knew I had to try it. I loved the dressing and tomatoes on top. It was the perfect return to bay area food trucking. 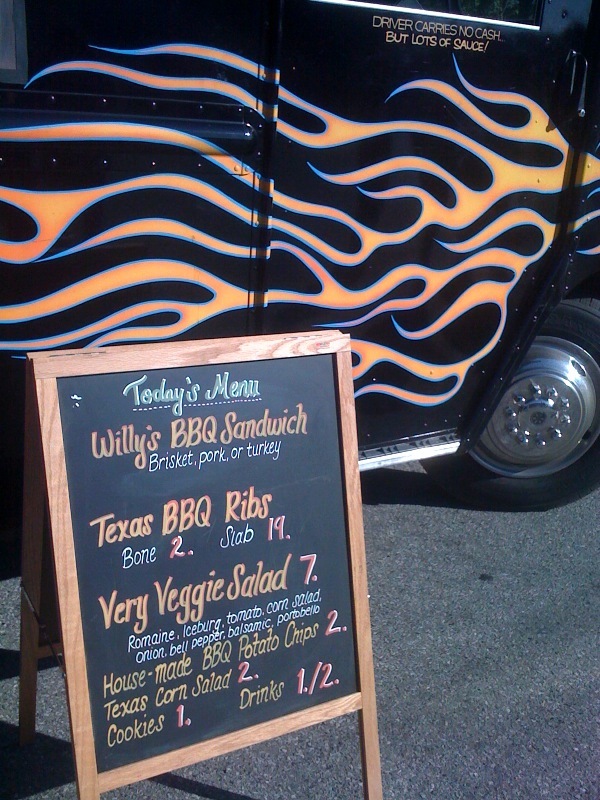 Next I went to The Armadillo Willy’s BBQ truck. 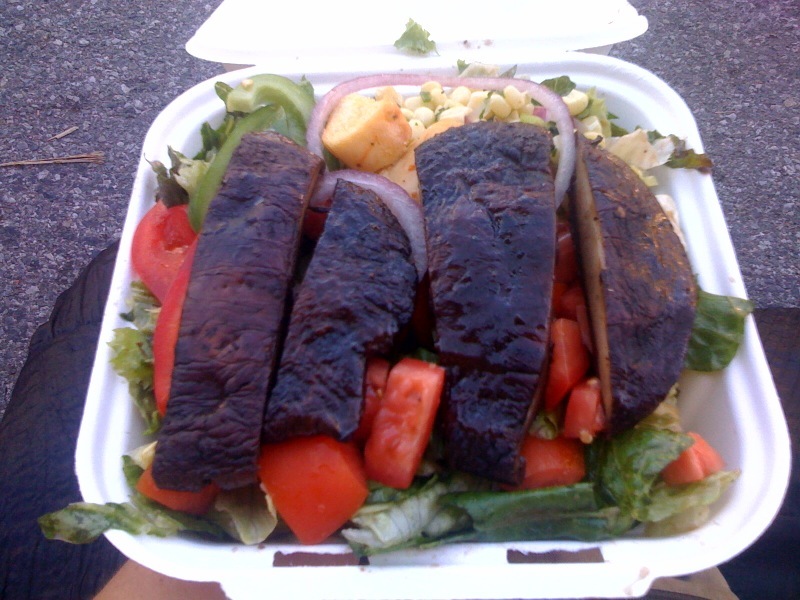 I was never a huge BBQ fan even when I ate meat, but they were serving a veggie salad that I hadn’t tried before. After eating something fried, I felt like trying something more healthy. As a new vegetarian, I find myself trying to expand my tastes and eat more veggies I didn’t used to eat since I’m already limiting my diet. I have started eating tomatoes and cucumbers when I didn’t before, and I’m working toward eating mushrooms as well. A lot of vegetarian dishes use portobello mushrooms as the “meat” of the dish, so I’ve been wanting to like them. This salad had huge portobello mushroom pieces on top, and unfortunately, I knew after the first bite it just wasn’t gonna happen. I ate the rest of the salad around them, but I’m still mad at my tastebuds for not adapting to mushrooms yet! My final stop for the night (that salad was filling!) was Twisted Chill. I was happy to see they had lowered their price from $5 to $4. They still only had one size though. 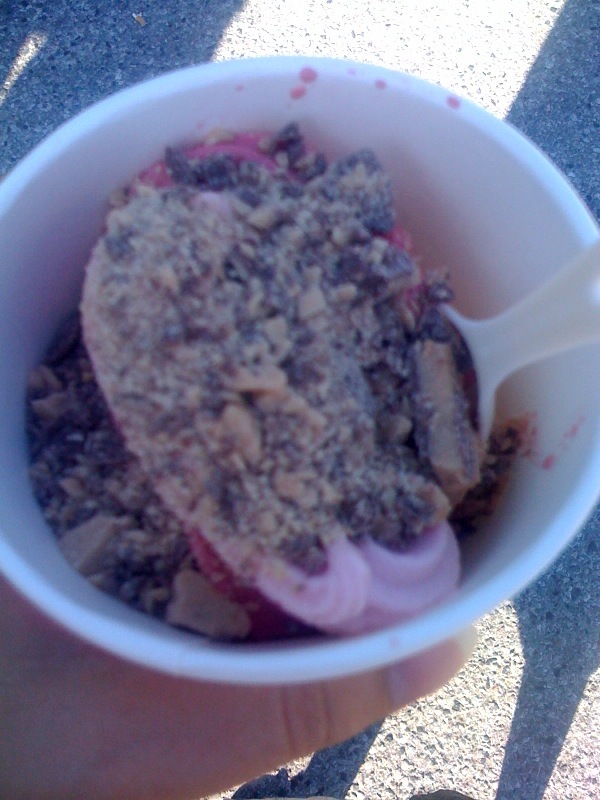 I loaded my cup up with the pomegranate raspberry flavor I loved so much from last time, and I added a little kiwi strawberry too. I only put one topping on it, bits of heath. Yum. While I enjoyed my foray into trucks from Chicago, Milwaukee, and Los Angeles, it still feels good to be home and eating from local trucks again. 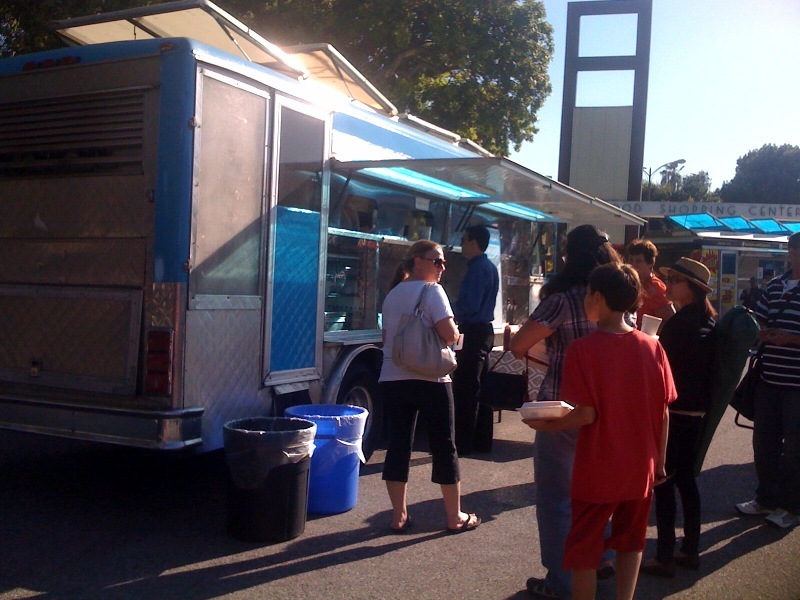 As I have mentioned, my first food truck experiences took place in the Los Angeles area. I’ve also mentioned that I recently hunted down exact dates so I could know which LA trucks I went to and when I went to them. I also scrounged up some photos from those food truck visits. (It took awhile since all my photos were deleted from my phone a few months ago, so I had to go way back in my twitter feed, but I did it!) I’m going to do this in a timeline format and add photos when I have them. Since we had eaten dinner before the play, my sister and I weren’t very hungry. We decided to share an order of their creme brulee toast, and it was delicious. I’m not even seeing it on their menu now, unfortunately. 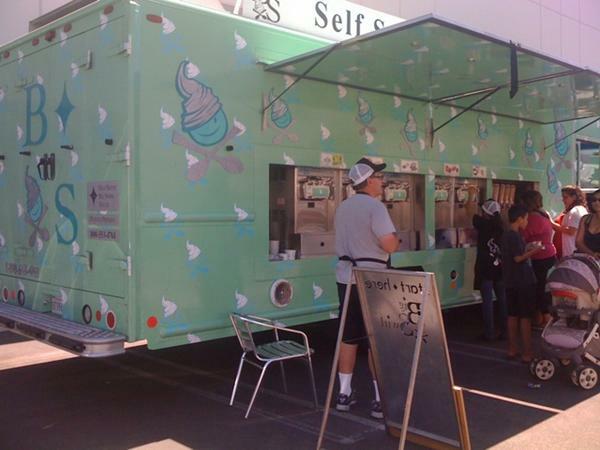 In fact, I’m not sure I would eat at their truck now since only the desserts are vegetarian. 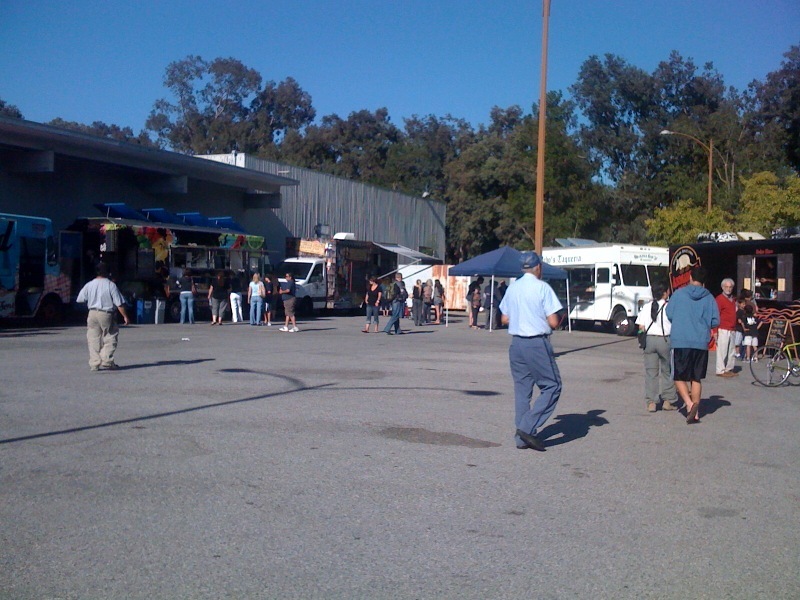 We were there with my brother-in-law’s brother, who worked at a building that had a lot of food trucks visit at lunch. He filled me in on Roaming Hunger, and thus, an addiction was born. Throughout the rest of my two week stay in Pasadena I went to ten more trucks in the LA area. 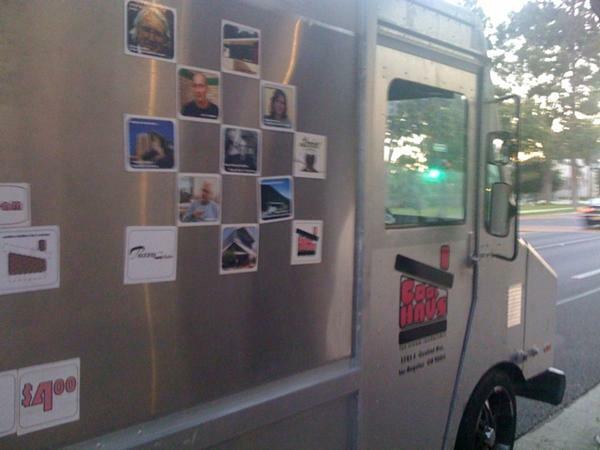 August 16th: I hunted down the Cool Haus Truck in Pasadena. I got an ice cream sandwich. I remember the ice cream being coffee toffee flavor, but I don’t remember what cookie I got. I think my memory has been clouded by my many subsequent visits to Treatbot. What I do know is that it was tasty. At the time, Cool Haus had trucks in both LA and Austin, and it appears from looking at their website that they now also have a truck in New York City. August 18th: Once again, a truck ventured to Pasadena, making it easy to bring my nephew doggy along for the ride. This time it was Frysmith. I got their vegan chili fries. Yes, even before I was a vegetarian I used to eat veg options occasionally. I think this is what helped make the transition easier. The fries were ridiculously filling and delicious. I remember not being able to eat them all in the parking lot and finishing a couple hours later. August 19th: This day I set out to hit up a few different food trucks. 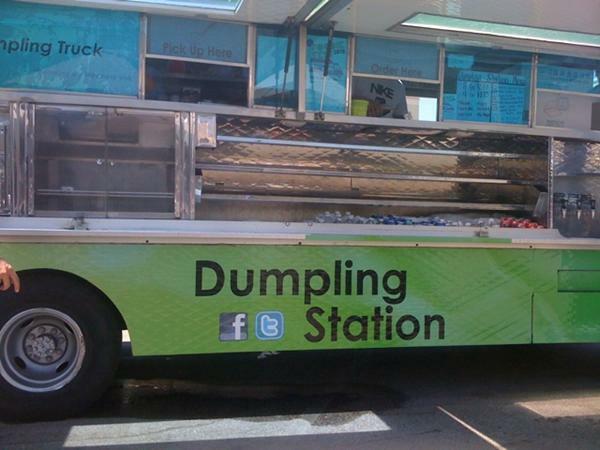 First, I went to Dumpling Station, easily one of my favorite trucks in the LA area and the only one I’ve been to more than once. I am biased though because dumplings, or pot stickers as I was raised to call them, are one of my favorite foods. I only got one order of chicken dumplings this time since I had a couple more trucks on my list. They also happened to be with Dogtown Dogs. While I didn’t become a vegetarian until recently, I haven’t eaten beef in ten years, so most of their menu was off limits. I did buy some tater tots though, and they brought me right back to elementary school. Next I hit up The Dim Sum Truck, although I didn’t get dim sum. I instead got their special for the day, which was a kung pao chicken taco. It was also spicy and full of flavor. I somehow didn’t manage to take a photo of their truck. August 26th: This was another double truck day for me, also in Burbank. 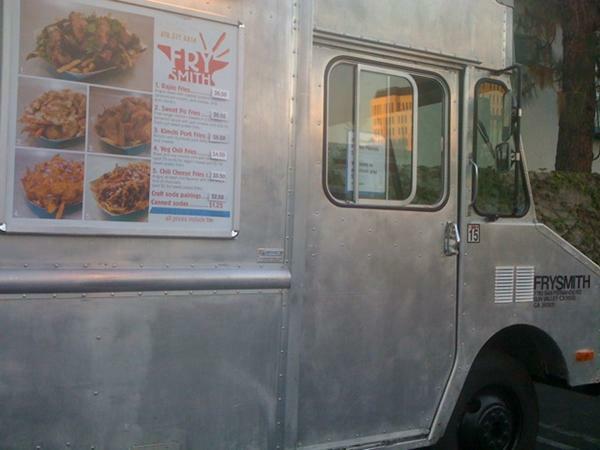 First, I went to The Jody Maroni’s Truck, which also has actual restaurants in the LA area. I got a chicken apple sausage that I thoroughly enjoyed. 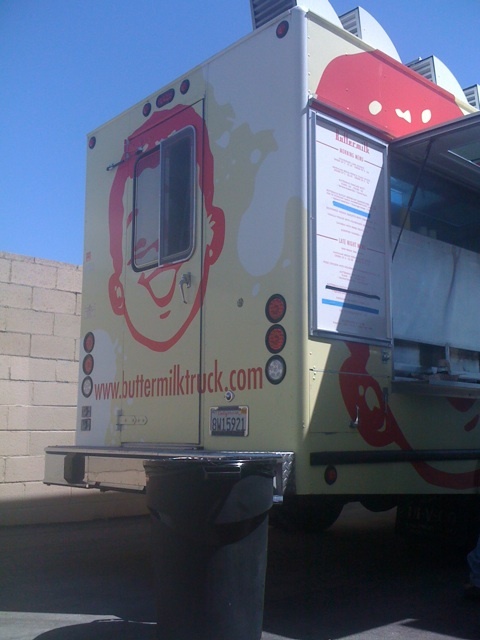 Then I made my way across town to where The Buttermilk Truck was parked. 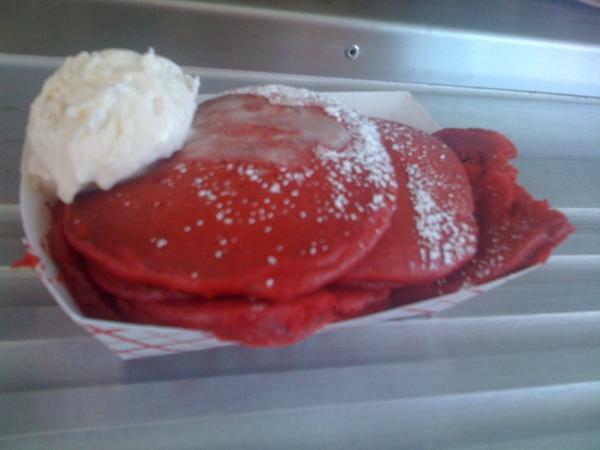 They are another one of the more popular LA food trucks, and I had heard amazing things about their chocolate chip red velvet pancakes. I was determined to get my hands (and mouth) on some. 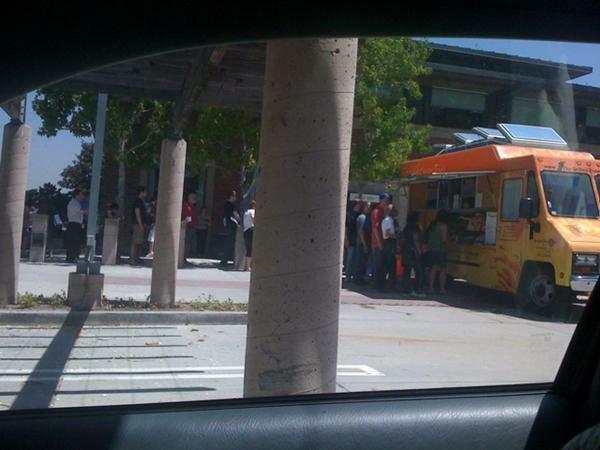 Little did I know, I was in for the longest wait I’ve ever experienced at a food truck (still, to this day!) in 97 degree heat. I waited an hour and a half for two pancakes. Was it worth it? I’m not quite sure, but they were definitely as delicious as one might expect. August 27th: After my sister and her husband returned from their trip to Peru, I shared all my experiences with my sister, and she wanted to join me on one of my food truck trips. I discovered there would be a gathering of a few trucks in Pasadena that night. We ate at Dumpling Station again (this time we got vegetable and kimchi pork dumplings). Then for dessert we had red velvet cake at The Sweets Truck. For some reason I didn’t take any photos on this day. Shortly thereafter I made my return trip to San Jose and immediately started scoping out the food truck scene in the south bay. On August 31st, I went to my first south bay food trucks, MoGo for lunch and Curry Up Now for dinner. And the rest? Is history. I have since been to Dumpling Station one more time, when my family was in Pasadena again for Christmas. We all shared a few different kinds of dumplings and their wasabi fries, which were awesome. My love affair with LA food trucks is far from over though. I will be dogsitting for my sister and her husband again the first week of August while they’re in Aruba, and while this time it will only be a week, I am still determined to go to as many food trucks as possible. I’ve eaten at over 150 mobile vendors. Click here to see a list of all of them!